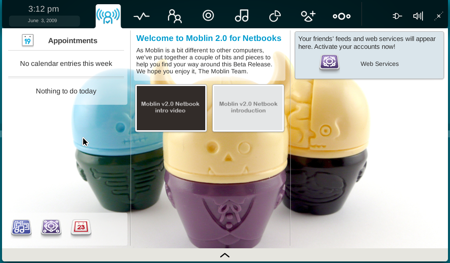 Originally developed by Intel - which is why it takes special advantage of the Atom processor - Moblin has now been handed over to the Linux Foundation for completion. Moblin isn't an Ubuntu respin, like so many netbook Linuxes, but a distro in its own right. When we first looked at Moblin, it was in alpha phase and looked like a fairly standard distro on the surface. Reading the documentation, however, it was obvious that some clever stuff was going on underneath. The sub-15 second boot-up time and support for all of our netbooks was also promising. The latest version, 2.0 beta, is a better indication of where things are meant to be. It's dramatically different to an off-the-shelf distribution and clearly pitched as an Android competitor. Acer is speculated to be using Moblin in a new range of netbooks, and several other linux distributions are looking to work closely with Moblin – including Canonical, the people behind Ubuntu, who are eager to release a Netbook Remix version. However, using the current version it felt much closer to an alpha than a beta – with quite a few apparent bugs even during the relatively short time we spent with it. Looking on the Moblin site, it seems most people are having troubles. 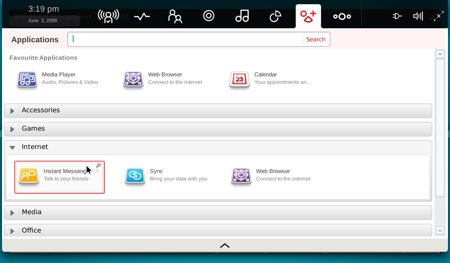 The interface is designed for the modern social networking, cloud-based user – which isn't everyone. It integrates Last.FM and Twitter straight into your welcome screen. Twitter functionality is pretty worthless though, displaying only a few recent tweets. A tab for updating your status is useful, but realistically, anyone who uses Twitter seriously will want to use something more powerful. Instant messenging is also integrated, but only supports Google Talk, Jabber and Salut. The exclusion of Skype and MSN will certainly get in the way for some users. There's no word processor as standard, but Abiword is in the repositories – but that's about it. There's no sign of OpenOffice and a lot of other common software. The interface is really nice to use, but we can't help but feel teased as this is from a complete product. Yet another distribution to keep an eye on, but not really ready for use. Did we miss out your favourite netbook distro? Use the Comments section to tell other netbook users why they should give it a try.